In Paris, I talked to a lot of people from the middle class as well as from the working class. There was one waiter, who was ironically from America, but who went to France in 1977. He was a Mexican-American, and it is very rare for someone in my culture to ever go and start living in another country. He told me that ordinary working-class people are not happy with their current president, the so-called "socialist" president of France. Working people, farmers in particular, are very angry with the sanctions against Russia, because they are not able to sell their products. There is a lot of unemployment in Paris right now. Prices are very high in terms of clothing and food. Therefore, if you really want to do well, you'll have to go to the side-street markets where a lot of North Africans have their venues and you can get products at reasonable prices. The prices in the key-lines are not normal. Another problem is that a lot of people are living on the streets. There is a lot of North Africans. 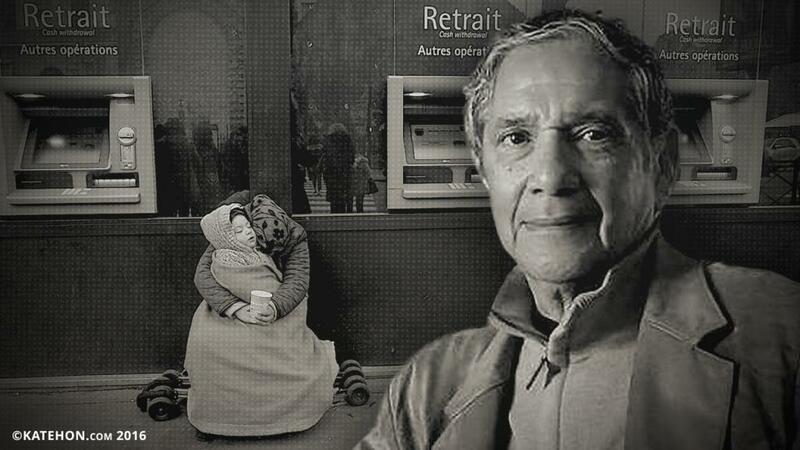 I took a photo of a North African woman with her child sitting right in front of cash machine and I thought that it is not unusual to see this kind of image of poverty on the streets of Paris these days. Culturally speaking, it is interesting that for French students or French businessmen, it is not unusual to go up and talk to the poor people in the streets and to be open with them, to give them some money. But you rarely find that in the United States, because the class differences are so severe and the demarcation line is so strict. But in Paris, there are people who do care. On the other hand, the middle class, when I observed them, was a lot different. There are a lot of artists in Paris, they are very creative, especially those from North Africa, that are doing sculpture, painting. There are also a lot of writers. What I found interesting now about the Parisians, particular the waiters, is they are very well educated, not like when I was in the army or when I went there. Now it's not rare to find a worker or waiter that has a master's degree. A lot of people smoke in France right now, especially in Paris due to the stress. Many citizens are not able to find work or the work they do find doesn't make a lot of money. Sometimes they have to find two jobs to subsist. My feelings about Paris as for a writer and a painter is that it is a good place to be right now. But there is political upheaval that I predict is going to take place in France. There is going to be a reaction to the Right because of the anger they have with the current regime which portrays itself as a socialistic but in fact is very similar to the Obama regime. It has hurt the French economy and French people psychologically as well as spiritually and culturally. The whole French culture is in disarray because of the shift to the right. Ordinary working class French people are confused by Hollande's policy. This is why Marine Le Pen attracts so many people.